The West Virginia Breast and Cervical Cancer Screening Program (WVBCCSP) is a comprehensive public health program that helps uninsured and underinsured women between the ages of 25 and 64 gain access to breast and cervical cancer screening services. The mission of the WVBCCSP is to prevent unnecessary disease, disability, and premature death due to cancer of the breast and/or cervix. Other services for those with abnormal results are available. The cost of the program is based on family size and income. 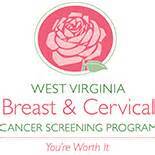 For more information please visit WV Breast and Cervical Cancer Screening Program or call 304-737-3665.